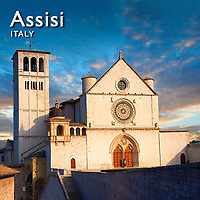 Pictures of Assisi and photos of the Basilica of Saint Francis, Italy. One of the great Saints of Christendom and the founder of a major Roman Catholic monastic order in 1208 was Saint Francis of Assisi. It should be no surprise therefore that the medieval hill town of Assisi in Perugia is dominated by the Monastery, Basilica and shrine of Saint Francis. Enriched since medieval by the pilgrims that still flock to Assisi to pray at the tomb of ever popular and venerated Saint Francis, the small hill town sits like a jewel gleaming out from a hill above a fertile plain of the Tiber Valley. Originally settled by Umbrian's who fortified the high ground above the plain, Assisi was inhabited successively by the Etruscans in 450BC then, after the Battle of Sentium in 295 BC, by the Romans. Columns of the Roman temple of Minerva can still be seen in the main square in Assisi as the facade of the Church of Santa Maria Sopra Minerva, a fine example of the use of pagan buildings by early Christians. Perched high above the town is the imperial fortress of The Rocca Maggiore, which was plundered in 1189, was rebuilt in 1367 on orders of the papal legate, cardinal Gil de Albornoz. Small stone buildings line narrow alleys that run down the hillside past the convent of Poor Clare, also founder by St Francis, to the great Basilica of St Francis which sits on top of the massive buttressed Franciscan monastery complex that rises out of the hillside. The Basilica and monastery of St Francis, a World Heritage Site, were begun immediately after his canonization in 1228, and completed in 1253. The Basilica has an upper floor, the Basilica superiore, and lower floor, the Basilica inferiore, below which is the crypt and shrine of St Francis. The lower church is entirely Romanesque in style with semi circular ribbed vaults across the nave and barrel vaults above the transepts. The Upper church has a Romanesque bell tower and an early Italian Gothic facade with a Gothic ogival door and Rose window of great simplicity that reflects the restrained style of the early Italian Gothic. The Gothic vaulted interior is a masterpiece of medieval Christian art decorated with the pastel frescoes of Giotto, started in 1280. Giotto used the Legenda Maior, the biography of St. Francis by St. Bonaventure (1266) to reconstruct the major events in the life of St. Francis. The humanist painting style of Giotto, setting the narrative in Medieval Italy and depicting real emotions, was a forerunner of the Renaissance art to follow. The lower Basilica contains some of the best examples of Tuscan art by Cimabue.